What’s this me hearties, pirates in St Asaph Cathedral? For two days the adventures of Captain Exmark and dog Spot and nephew Luke Ovarthar and puppy Patch will be played out at the Cathedral. They will feature in a colourful premiere of a specially commissioned musical work for North Wales International Music Festival that’s being held between September 24 and October 1. Welsh composer Gareth Wood has created a 25 minute score to accompany a story written by children’s poet and writer Francesca Kay, from Hay on Wye. The cathedral setting in St. Asaph is much more appropriate than people might think – thanks to a couple of real-life 18th century pirates. New research claims that Long John Silver was based on a Welsh adventurer who came from Denbighshire. Following a nine-year investigation, author John Amrhein is adamant that Robert Louis Stevenson modelled his classic novel Treasure Island on the lives of Owen and John Lloyd, brothers born in nearby Rhuddlan. Owen is believed to have sailed to the West Indies and went on to bury 52 chests of Spanish silver pieces of eight on the deserted Norman Island, part of the British Virgin Islands. And John had a wooden leg – just like the book’s famous character. Tŷ Cerdd Music Centre Wales based at Cardiff has commissioned the new work inspired by the Welsh pirates. It will be performed by the Cardiff County and Vale of Glamorgan Youth Symphony Brass Ensemble. Gareth, who has worked with the world’s greatest conductors and was a member of the Royal Philharmonic for 33 years, said his commission was one of the “most enjoyable” of his career. 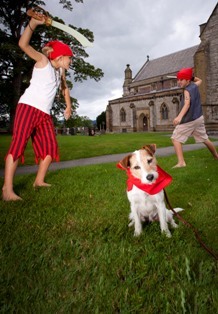 “Sea Dogs – A Pirate’s Tail (corr)” is part of Ty Cerdd and the Festival’s drive to encourage musical appreciation, story-telling and composition in the community, involving dozens of primary schools in Denbighshire and Flintshire. The project is part of the North Wales International Music Festival’s education programme, working in conjunction with the festival’s resident ensemble, Ensemble Cymru. This project has been supported by the rural development agency Cadwyn Clwyd and funded through the Rural Development Plan for Wales 2007-2013 which is funded by the Welsh Government and the European Union. The Owen brothers aren’t Wales’s only claim to fame in relation to piracy. Black Bart who gets a mention in the St Asaph premiere was born John Roberts in Carmarthenshire and regarded as one of the most successful pirates in the Golden Age of Piracy having captured over 470 ships. Francesca will narrate the story, which includes a ghostly cameo from legendary Welsh pirate Black Bart – Barti Ddu, at the Cathedral on September 27 and 28 – dressed as Captain Exmark’s grandmother. “A couple of years ago we came up with First Dragon for the festival and it was hugely successful. Ty Cerdd wanted another fun piece for the St Asaph festival. I thought kids love dinosaurs and pirates and Ty Cerdd said let’s go with pirates. So I’ve included a foolish adult with a sensible child, Luke, who saves the day. I’m very pleased with the results, it’s full of puns and jokes,” said Francesca who runs writing workshops. I’m delighted to be part of the festival, it’s a fantastic event,” she said. Gareth Wood, 61, who lives and works in London but still visits family living near his home village of Cilfynydd, is planning to visit the festival for the performance on September 27. And if you need to get into the mood for pirate stories, remember that September 19 is Talk Like a Pirate Day! Other highlights at the festival include the world premiere of a new work by the royal composer, Paul Mealor, who shot to global fame thanks to the sensational Royal wedding anthem he wrote for Prince William and Kate Middleton, and a concert by piano virtuoso Llyr Williams. The festival’s Artistic Director, Ann Atkinson, is a talented mezzo soprano in her own right and will again be among the singing stars this year. In addition, Mid Wales Opera are going to be performing the Puccini favourite, Madam Butterfly. North Wales International Music Festival, September 24-October 1, http://www.nwimf.com/ or ring 01745 584508 for tickets and information.